I have a great fondness for my name ('like a big, round, yellow lollipop' says my friend with synaesthesia), but there's no doubt that rhyming with 'wally' and otherwise being associated with a variety of milkmaids and parrots has it's downsides. And I am fortunate that my husband's fondness for a near constant infusion of tea does not make him take advantage when I am kettle bound. He probably knows he would not be my husband if he did. 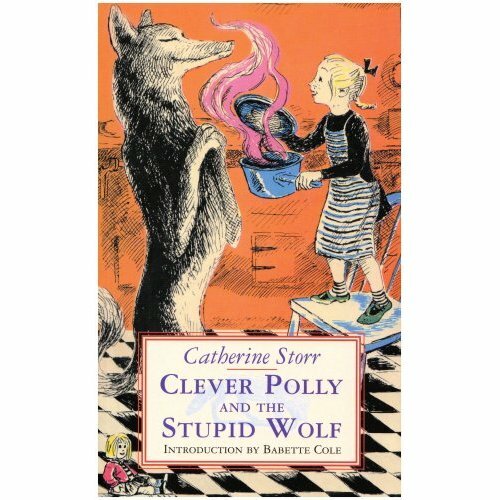 But Catherine Storr's 'Clever Polly' is a namesake to be proud of and aspire to. These short stories have remained in print more or less since 1955 and are as fresh and funny as ever. I made the mistake of first trying to read them to Bill too young, reasoning that because they were short they were a good 'starter' chapter book. In fact they were way too subtle for him, and he probably wasn't familiar enough with his classic literary wolves to enjoy them properly. Now, their time has come. Polly is a smallish girl of indeterminate age but independent habits who is plagued by a cold caller wolf who openly wants to eat her. Fortunately Polly is possessed of remarkable wit and resourcefulness and the wolf, whilst full of the beginnings of plans, has not paid close enough attention to his fairytale heroes and their conclusions. Thus he tries to plant a beanstalk to climb up to Polly's bedroom window- but has made the critical mistake of not purchasing 'magic' beans. Or tries to huff and puff her house down with an inadequate pair of bellows. Or gets ripped off by a witch who tricks him into thinking he's invisible. '"Good morning, Wolf," said Polly. "What are you planting this time?" "This time," said the wolf, "I've had a Really good idea. I'm planting something which will grow up to your window in a moment." "Oh," said Polly, interested. "What's that?" And secondly, the genuine and delicious frisson of fear contained within the humour. Polly really does have to work to save her skin; she is clever. And in a 1950's world where she shops on her own and stays home by herself, there is no comforting sense of an adult ready to intervene at any moment if she can't talk herself out of trouble. The child reader/listener gets just enough taste of what real independence might mean to wonder how they themselves might measure up under such circumstances. In the story 'In the Wolf's Kitchen' Polly actually gets caught and imprisoned for several days and is only saved by her excellent housekeeping skills. The darkness accentuates the funniness; the delight of shocked giggles. '"Now Polly, I've really got you at last, and this time all your cleverness won't help you, for I am going to gobble you up." "Oh very well," said Polly, obligingly. She looked round. "Where is the kitchen?" she asked. "The kitchen?" said the wolf. And finally it is the loveable loneliness of the wolf and the ever-so-slight smugness of Polly that has kept these stories in print. I think it was probably one of my first experiences of split loyalty as a child reader and understanding how emotions can be manipulated by skillful writing. Because Polly always wins and always gets away and one couldn't/can't help feeling empathy for poor wolf. It's not that I wanted him to eat Polly but surely some other small girl with a different name might have been expendable? Just thought you might be interested, I referenced your blog today on mine. C.